LOUDON, N.H.—Was this real or instant replay? For the second straight week, in the second race of the Chase for the NASCAR Sprint Cup, Matt Kenseth led Joe Gibbs Racing teammate Kyle Busch to the finish line — and for Kenseth, who has struggled at New Hampshire Motor Speedway, that added a dreamlike quality to the victory. The top seed in the Chase, Kenseth won Sunday’s Sylvania 300 by .533 seconds over Busch as JGR asserted its superiority for the second consecutive week. A half hour after the race ended, the magnitude of the victory was still sinking in for the 2003 Sprint Cup champion. 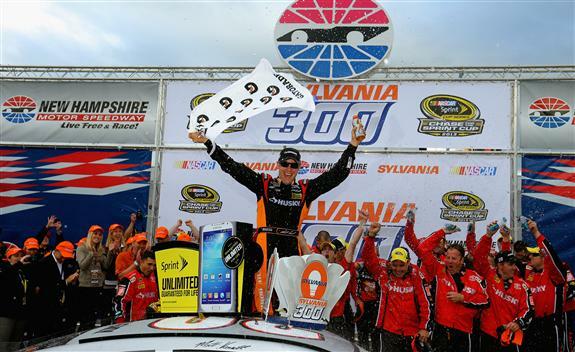 “For me to win at New Hampshire, first of all, is more than a stretch and more than a dream,” Kenseth said. “This is probably one of my worst places. That just shows you how good this whole team is. … I didn’t even know there was a Victory Lane here. Kenseth led a race-high 106 laps in winning for the seventh time this season, for the first time at the Magic Mile and for the 31st time in his career. Winning in his 500th start in the Sprint Cup series, Kenseth extended his Chase lead to 14 points over Busch. Greg Biffle drove from sixth to third after the final restart on Lap 258 of 300. Five-time champion Jimmie Johnson finished fourth, followed by Jamie McMurray and Dale Earnhardt Jr. Though Busch closed on Kenseth in traffic late in the race, the driver of the No. 18 Toyota acknowledged that his teammate had the superior car. Kasey Kahne saw his Chase hopes dim when he spun on the frontstretch on Lap 252 and nosed into the inside wall. Kahne came home 37th and fell to 13th in the standings, 71 points behind Kenseth and all but out of the running for the championship. Brian Vickers, the July winner at the 1.058-mile track, started in the rear and finished seventh. Vickers was racing in the Nationwide Series at Kentucky Speedway and enlisted Kenny Wallace to practice and qualify his Sprint Cup car on Friday. Because of the driver change, Vickers had to drop to the back of the field for the start. Jeff Burton, Carl Edwards and Martin Truex Jr. completed the top 10. Truex led 98 laps but fell back during the final 43-lap green-flag run. “We had a good car the first half of the race, and then the second half, we just started getting tight,” said Truex, whose sponsor NAPA announced Thursday it was leaving Michael Waltrip Racing at the end of the season in the wake of penalties to the organization for attempting to manipulate the outcome of the Richmond race two weeks ago. Notes: Kenseth ran a special paint scheme commemorating his 500th start. The only other driver to win in his 500th Cup start was Richard Petty in 1970. … Johnson is third in the standings, 18 points behind Kenseth and the only driver other than Busch with 36 points of the leader. … Kenseth is the third driver to win the first two races in the Chase. Tony Stewart accomplished the feat in 2011 en route to his third title. Greg Biffle won the first two Chase races in 2008 and finished third in the final standings. 1. (9) Matt Kenseth, Toyota, 300, $262066. 2. (12) Kyle Busch, Toyota, 300, $210143. 3. (10) Greg Biffle, Ford, 300, $146585. 4. (11) Jimmie Johnson, Chevrolet, 300, $160796. 5. (23) Jamie McMurray, Chevrolet, 300, $142005. 6. (17) Dale Earnhardt Jr., Chevrolet, 300, $115835. 7. (29) Brian Vickers(i), Toyota, 300, $105235. 8. (25) Jeff Burton, Chevrolet, 300, $102535. 9. (26) Carl Edwards, Ford, 300, $127360. 10. (5) Martin Truex Jr., Toyota, 300, $135060. 11. (20) Brad Keselowski, Ford, 300, $140826. 12. (14) Denny Hamlin, Toyota, 300, $105785. 13. (4) Kurt Busch, Chevrolet, 300, $115830. 14. (6) Joey Logano, Ford, 300, $115668. 15. (3) Jeff Gordon, Chevrolet, 300, $131696. 16. (1) Ryan Newman, Chevrolet, 300, $128693. 17. (16) Clint Bowyer, Toyota, 300, $124793. 18. (22) Marcos Ambrose, Ford, 300, $112874. 19. (15) Juan Pablo Montoya, Chevrolet, 300, $112574. 20. (8) Kevin Harvick, Chevrolet, 300, $130046. 21. (13) Aric Almirola, Ford, 300, $121746. 22. (7) Paul Menard, Chevrolet, 300, $114451. 23. (18) Mark Martin, Chevrolet, 300, $127660. 24. (31) Ricky Stenhouse Jr. #, Ford, 300, $130471. 25. (34) Casey Mears, Ford, 300, $110443. 26. (35) David Reutimann, Toyota, 300, $99593. 27. (21) Danica Patrick #, Chevrolet, 300, $83110. 28. (30) Travis Kvapil, Toyota, 300, $104968. 29. (19) David Ragan, Ford, 299, $102193. 30. (27) Michael McDowell, Chevrolet, 297, $100832. 31. (38) Dave Blaney, Chevrolet, 297, $79085. 32. (43) Josh Wise(i), Ford, 297, $78810. 33. (37) JJ Yeley, Chevrolet, 296, $78585. 34. (32) Landon Cassill(i), Chevrolet, 296, $78385. 35. (36) Joe Nemechek(i), Toyota, 296, $78185. 36. (42) Timmy Hill #, Ford, 293, $77955. 37. (2) Kasey Kahne, Chevrolet, 278, $103241. 38. (33) Kevin Swindell(i), Toyota, 244, $72675. 39. (24) David Gilliland, Ford, Accident, 239, $68675. 40. (28) Bobby Labonte, Toyota, Accident, 161, $72675. 41. (39) Tony Raines(i), Chevrolet, Brakes, 128, $60675. 42. (41) Johnny Sauter(i), Ford, Brakes, 103, $56675. 43. (40) Scott Riggs, Ford, Brakes, 92, $53175. Time of Race: 2 Hrs, 57 Mins, 02 Secs. Margin of Victory: 0.533 Seconds. Lap Leaders: R. Newman 1-2; K. Kahne 3-31; M. Truex Jr. 32; J. Yeley 33; K. Kahne 34-35; M. Truex Jr. 36-108; M. Kenseth 109; J. Gordon 110; B. Keselowski 111-112; J. Logano 113; D. Earnhardt Jr. 114-129; M. Truex Jr. 130-152; M. Kenseth 153-165; M. Truex Jr. 166; J. Gordon 167-201; D. Earnhardt Jr. 202; C. Bowyer 203-207; M. Kenseth 208-246; J. Johnson 247; M. Kenseth 248-300. Leaders Summary (Driver, Times Lead, Laps Led): M. Kenseth 4 times for 106 laps; M. Truex Jr. 4 times for 98 laps; J. Gordon 2 times for 36 laps; K. Kahne 2 times for 31 laps; D. Earnhardt Jr. 2 times for 17 laps; C. Bowyer 1 time for 5 laps; B. Keselowski 1 time for 2 laps; R. Newman 1 time for 2 laps; J. Johnson 1 time for 1 lap; J. Yeley 1 time for 1 lap; J. Logano 1 time for 1 lap. Top 13 in Points: M. Kenseth – 2,111; Kyle Busch – 2,097; J. Johnson – 2,093; C. Edwards – 2,075; G. Biffle – 2,073; K. Harvick – 2,072; Kurt Busch – 2,071; J. Gordon – 2,069; R. Newman – 2,064; C. Bowyer – 2,063; D. Earnhardt Jr. – 2,049; J. Logano – 2,042; K. Kahne – 2,040.